Why should you avoid using Powdered Carpet Deodorizers? The carpet powder deodorizer instructions say, “sprinkle on carpet and simply vacuum it up!” However, sprinkle deodorizers can not only set stains, they can also cause wicking, crocking, and even potentially ruin your carpet or rugs. What are Powdered Carpet Deodorizers? You may have seen these little cans in stores called “Carpet Deodorizer” that instructs you to sprinkle this powder onto your carpet wherever there is a bad odor and vacuum it up afterwards. Some people also use baking soda as a carpet deodorizer. These sound like simple and benign products, so why are they bad? Powdered carpet deodorizer and baking soda is made of a fine grit. When you sprinkle it into your carpet, it can be nearly impossible to vacuum up every tiny particle. No vacuum can remove 100% of soil, including powdered carpet deodorizers. Moreover, when you sprinkle it the powder gets deep down into the foundation of the carpeting, causing the deodorizer to rub against the fibers. Even after vacuuming some residue will be left behind. Then when your fibers get rubbed together from simple use this left-over grit causes wear and your carpet can also get dirtier faster. 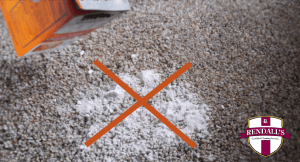 Are there any other reasons you should avoid Powdered Carpet Deodorizers? Beyond potentially damaging your carpet and rugs, the main reason we don’t recommend these powders is because they don’t actually remove the source of the smell. If there is one takeaway from this (and many of our other articles on odors) remember this: To remove odors you MUST remove the source! Sure it may seem like it’s working for a few hours – maybe even a few days – but that smell usually returns because the source of the odor is still there. Let’s say there is smelly pet urine smell on the carpet. You sprinkle this stuff on to the urine spot and vacuum it up, but the smell keeps coming back. This is because these deodorizers don’t actually remove the source, they mask the odors. When the deodorizer wears off in a matter of hours or days, the odor returns. Urine spot have to be decontaminated and cleaned properly and thoroughly in order to get rid of the smell. Especially when dealing with pet urine where there are many layers to the cleaning process. Remember – to remove the odor you MUST remove the source!